ASHEVILLE, NC, USA, October 25, 2018 /EINPresswire.com/ -- Immediate Records and Charly Records are to celebrate the 50th Anniversary of the Small Faces' much loved third album “Ogdens' Nut Gone Flake” with the release of a variety of new and very special deluxe editions across various formats (including deluxe triple 180-gram red, white & blue coloured vinyl LP box-set and a comprehensive 3CD+1DVD earbook set) on 26th October 2018. A red, white & blue coloured vinyl 180-gram half-speed mastered 3LP box-set (Immediate IMBX012) boasts a new softback 12” x 12” 72-page book full of Gered Mankowitz photos, original artwork, rare memorabilia, in-depth sleevenotes and interviews conducted with band members over many years by journalist & writer Mark Paytress, plus introduction by Kenney Jones. LP1 consists of the original mono mix of “Ogdens' Nut Gone Flake,” LP2 features the album's original stereo mix, whilst LP3 boasts a plethora of rare tracks released for the very first time on vinyl, all providing a fascinating snapshot of this key period in the acclaimed British band's career. The comprehensive new 3CD+1DVD earbook set (Immediate IMEB012) comprises both original mono and stereo versions of the album together with a third CD that boasts an expanded version of the vinyl box-set's bonus LP disc, additionally featuring gems such as the rare American single versions of “Mad John” and “The Journey” plus the much sought after mono “Afterglow Of Your Love” (Alternate Single Mix), previously only released as a long sold-out 7” vinyl single for Record Store Day 2015 and made available here on CD for the first time. 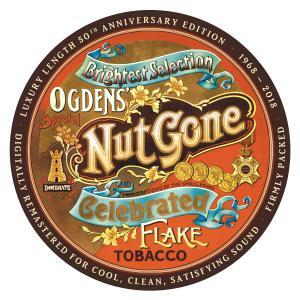 The contents of the vinyl book are also reproduced while this edition's DVD boasts a real gem; although “Ogdens' Nut Gone Flake” was never attempted live (in part due to its sheer complexity), the band did perform seven of the album's twelve tracks on one occasion - the 21st June 1968 edition of BBC TV's Late Line-Up Colour Me Pop show. This BBC TV studio performance is included on the new box-set's DVD. Previously only available in grainy quality on a long-deleted VHS video release and as part of a hard-to-find DVD compilation, this new box-set's audio & visual DVD content has been cleaned-up and is presented here in the best quality possible.